Well, hello there, owner of canine! Welcome to Lindy Nolan Dog Obedience. We're so glad you stopped by! Do you need Barkus Interruptus? Do you have Jumpus Extremis? Well, we have the answer to your problem! We can teach your dog self-control using Love, Laughter, and Cookie Power. We will have fun playing with your furry friend. Using no force or any scary tactics, you and I will share the wonderment of "Pawsitive Communication" between you and your pet.Using not only useful but really fun games and puzzles you will educate your puppy or dog using Love, Language and Leadership!! group classes that start almost continuously!!!! 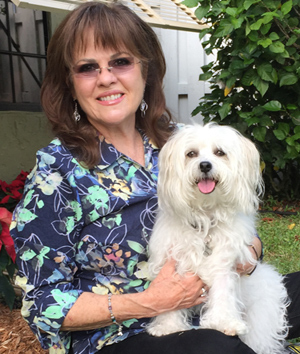 one of Florida's Premier Dog Training Experts.